Pruning roses for the winter season is important. Roses have long been a favorite of many gardeners, but the frigid months of north can be detrimental to any plant and roses are no different. As the weather begins to change, so do the needs of the roses we enjoyed over the growing season. Having a strong understanding on how to prune roses for their winter dormant season will help ensure another year of blooming beauties to follow. 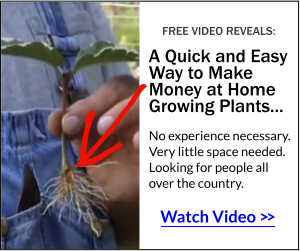 Make Money at Home Growing and Selling Small Plants. Mine have Earned Thousands! When the weather begins to shift to the colder months, it becomes important to prune and prep the rose plants for their dormant season. Important elements in properly caring for rose plants includes: removal the dead blossoms, pruning back any dead leaves stems or canes, tying the canes of rose bushes together, mounding soil or mulch 8-10 inches around the canes, and depending on the harshness of your winter, covering the rose bushes completely. Pruning rose plants after the last bloom stores the roses energy during the dormant season. The removal of spent blooms (where the seeds are stored) and cutting the canes to 28-34 inches will help protect the roses from the damaging cold winds of winter. It is important to also remove all dead and fallen leaves from around the roses before mounding the soil or mulch. When you prune your roses you don’t have to throw away the clippings that you remove. As long as the roses are not patented you are free to propagate them and create more plants. Watch the video below. After the rose bushes have there mulch (or soil) covering in place, put leaves or straw on top. There is a multitude of preferences gardeners use during this step. Some prefer securing the cane by wrapping it first, then mounding inside the secured cane. Some even choose to use some types of shredded wood, chips or sawdust instead of mulch or soil. Rose gardens can be both an art and a science, and each gardener may have their own tried and true methods. In locations where the winters tend to be more harsh, it is recommended to also cover the rose bushes. When covering roses, be sure to insulate the insides of the structure and poke holes in the structure for proper air circulation. When I was trying to decide if I should cover my roses for the winter I again turned to Mike. “If you decide to cover your roses for the winter, don’t use clear plastic. Clear plastic causes plants to heat up which takes them out of their dormant state.” To an amateur gardener like myself, I would have never thought of the effects of clear plastic on my roses. I am glad I asked! When the weather breaks, simply remove most of the mulch or soil that was mounded with in the rose bush. HELP! two multiflora bushes i pruned last fall survived my work and are growing and blooming BUT one of them has new growth that is deep maroon with deformed blossoms. the other bush is fine. is it diseased? sheer coincidence? we do not fertilize or mulch and the two roses are several yards apart with no other roses on the property. thanks so much for your help! At this point I wouldn’t be too concerned, just wait and see how the plant looks next spring. thank you for this information.when is the best month to do this/? Thanks for this info Mike. Unfortunately I’m just reading it now as the snow finishes melting here in VT. I have a fairly large rose bush that had a tough time last year with black spot fungus. I know that its going to need some extra TLC this season. Is it ok to prune it now…or soon? Do you think I should give it a hard prune or just cut it back a bit? Also have you ever used banana peels to fertilize your roses..I’m thinking about trying it. Never used banana peels but I’m sure they won’t do any harm. How much good they’ll do is debatable. I’d cut the rose back hard if it were mine. Please disregard my last post. I did not scroll down far enough. I got all the information I need. Thanks. Thanks for the information. Just finished 4 different roses. Also I am making your fudge again this year. Hope it works \, don’t have on bib overalls. I live in MN so going from pruning to rooting to planting in 6-8 weeks is unrealistic. What do you suggest? God Bless! I bought a rose over the summer. It was so hot I never got it in the ground. I am in Missouri. Is it to cold to plant now or can I put it in the basement for the winter? Mike, get it planted outside. It needs to go completely dormant. Planting late into the winter is fine as long as the ground isn’t so frozen you can’t dig. Mike I watched your video on how to propagate roses I done everything as you showed it and left it for whatever time you recommend and when I unwrapped the package I had nothing but molded stems. I used Rooting hormone made by GREEN LIGHT I”D like to try again any thing there you see I done wrong? When did you do it? This is something that should be done during the winter when the plants are dormant. You can try wrapping just the cut ends in wet paper, then the tops in dry paper and still store in a cool place. Thanx Mike to you and your rose-pruning/propagating friend. Will be doing it this week…hoping I beat the worst of the cold front coming our way. My holly tree is getting ugly with new growth going askew. when can I trim it. Fred, trim it any time you want. Seriously. I trim all of my plants anytime I see the need. Winter or summer. Thanks for the help. What about tree roses? We also have roses in pots. We live in North-central FL. We just had our first freezing night, and in a cold winter can get down to low 20s/high teens. Nancy, you can trim them now and if you are concerned about the cold just bury the pots for the winter. That should be fine in Florida. How far should they be trimmed back? I am having problens with roses getting minature canes, leaves and flowers. It is spreading from one to now about 10-15 plants. I have dug up complete plants and also tried pruning the cane down to the crown. Any thoughts? I have about 70 plants left. Almost all are hybrid teas. About 10 are floribundas. I dread the idea ofdigging them all up or losing some every year. I only bought 5 replacements this year, but I am afraid they may just die from this condition/disease/virus/fungus. Greg, about all I can recommend is start treating them in the spring with Bayer 3 in 1 rose and flower spray. This is a systemic product and should help with fungal issues which could be whats wrong with your roses. what temps should the rose cuttings be stored at? i’m guessing that they prefer a fairly narrow range … say from 35 to 45 degrees, right? not freezing but real chilly? and would they do ok if stored in a refrigerator? Frank, closer to 45 degrees would be good. You want them dormant, but not so dormant that the rooting process stops. The fridge should be fine. I have two knock out roses in pots. Sometimes our winters in Okc, ok are real cold other times it is above average. Will the roses survive in the pots sitting on the covered porch or should we put them in the ground? Also should I prune them now or spring. Carol, plants are always the safest in the ground. Even if you bury pot and all they’ll be much better. More moisture and heat from the ground. Plants don’t do well when they are cold and dry. I have had many roses over the past 40 years and I’ve always listened to the old saying: Plant the crown above the Mason-Dixon Line below the ground. Below the Mason-Dixon Line, plant above. I live in the north so I always cut my roses back to about 12 -18 to lessen wind damage. There is always a little dieback come spring and I remove that just before the new growth breaks. I don’t mulch or wrap unless they’re further out in the landscape. Near the house they bloom into December because they’re warm from the heat radiating off the brick facade. Do your recommendations also apply to groundcover roses? How do you prepare them for the Northern Illinois winters? This is the first year we’ve had the roses. Any help would be greatly appreciated. Sherri, there are always different ways to do things when it comes to plants. If you leave them unpruned sometimes that protects the stems that you really want to keep. Then come spring trim up as needed, removing any dead stems or canes that are just growing randomly. I agree that roses should be pruned in the fall..However, when I looked at websites concerning “knockout roses”, they recomended pruning them in the spring.. What do you think? Betsy, there are advantages to early spring pruning. If you leave the branches on the roses all winter the cut ends won’t be subjected to the wind and cold. The down side is that if you don’t get them pruned in the early spring before they start growing you’ll get all kinds of new growth on stems that should have been removed. Thank you for your guidance in the garden, it is wonderful to just ask what I need without looking through pages of info I don’t need ( well at that moment). Please continue to take care of your readers as well as you take care of your plants we are grateful! Thank you Donna, I appreciate that. I try to pay attention to what I am doing in my own landscape and my nursery and to remind myself of what I should be sharing and when I should be sharing it so people get the info they need when they need it. Hi. I’m new to gardening and just happened upon your website. Great video about propagating roses. How long do you leave the cuttings inside the bags? Will there be new growth at this time? Also, what applies to us Southern California gardeners? Do we need to prune and mulch our roses in winter, too? Pat, those cuttings should stay wrapped up for at least 6 to 8 weeks. Then you can pot them. In warmer climates you don’t need to mulch your roses like we do in the north. Even in the north not all roses need to be mulched. What happens after 6 weeks to plant cuttings? What monthe would that be preferably? Here in Boston it would be cold in the spring. Thank you! Donna, if the roses have no new growth on them in 6 weeks you can put them outside. If they do have new growth you can pot them up and keep them protected until the danger of frost is past. The other option is to do this later in the winter so the timing is better. Glenda, I’d leave them in there at least 6 weeks, 8 weeks or longer. You can check on them and if rooted or even just calloused up you can pot them and keep them inside until late spring. What about aftercare and rooting? How long wrapped in bags? What medium do you plant in? Under lights or not? Kerry, any potting medium that drains well would be fine. Lights? Yes, if the plants are starting to leaf out they’ll need some light. Betty, the roses will root while wrapped in the paper. After rooted you can just pot them or plant in your garden depending on when you unwrap them. Thanks Mike. I wish I had got this idea before it got down in the 30’s. Maybe we will have another warm day that I can do this to my two rose bushes. Betty, this is a winter technique, you want the plants dormant before you do this. We often make cuttings all winter long. Thank you so much for the info on pruning roses. My roses are out of control and I didn’t know when to prune. One question, I watched the video on how to propagate roses,, after you put the rose clippings in the plastic bags how long do you leave them like that ?? Can they be plated in the ground in early spring? Dana, leave them in the bags 6 to 8 weeks, then plant them in your garden. When you say to cut the rose canes down to 28-32 inches for the winter, does that include climbing roses? Will they really grow enough to climb up a trellis in only one season? Thank you. Mike, I love your site and very much appreciate all the information you so willingly provide. It’s my go-to site for any gardening questions I have – I always find the best answers there. Sheila, the climbing roses I’d leave on the trellis, just trim them up as needed so when they start growing in the spring they look good. I have a knock out rose and live in Houston,Texas area and wondering if I need to do something special with it. It is in a large planter. Diane, in Houston all you need to do is trim as needed to keep it shapely. Lou, 6 to 8 weeks in the plastic bags then plant them in your garden. If you do them later in the winter the timing would be ideal. Wow, so simple and cost effective. Thank you. Any tips on the Rugosa Roses? They grow well in our very hot and often dry climate of Missouri. Thanks again. I tried propagating roses last year using the method described in the video. However, when I unwrapped them, they’d turned moldy. Any advice on what went wrong? EJ, mold is a sign of things being too wet and too warm. THis is a timely message. I planted a couple new roses this year for everblooming up near the picket fence. I have a large rose that has sort of thinned out half way up, so I will prune that one and also protect it. i have huge huge climbing roses that have produced for 15 years and gotten larger, reaching very high over the deck and full of blooms. my husband gives them fish emulsion every year, other than that, nothing. no raking the leaves from the 250 yr old beech tree that is a monster tree that seems to protect that nice sunny area. Anyone want to weigh in on growing mini roses in a greenhouse? I am thinking for the assisted lving residents this is a nice project…. BTW would the foam they put on pipes be o.k. to put on the trunks of my small fruit trees or do you think it might cause rot. Sorry if I sound so stupid about gardening where it freezes but I really am out of my element. Rhonda, I’d use something like corrigated drain pipe so you have air circulation and won’t hold moisture against the trunk of the tree. I am newly moved here from Ca. I had to leave all but a few of my 350 roses, most on their own roots since I propagated them myself. In winter I left the hips on and cut off all the leaves to try to coax them into dormancy since our weather was mild. I don’t want to lose the few I brought with me to Ky. Would it help to cover them with burlap? Rhonda, burlap will be fine, It won’t keep them from freezing, but it will break the wind. Hi Mike, I just finished watching the video by Jeff Stover on propogating rose cuttings. It didn’t say how long to leave them wrapped in the plastic bags, or what to do with them when the plastic comes off. Thanks so much for clarifying this matter for me,and for all your great advise!! I did not see your response regarding how long to leave the rose cutting wrapped and what to do with them after unwrapping. Leave them wrapped about 6 weeks, then just plant in soil and keep out of frost until spring.